G rasses and/or grass legume mixtures can provide out-standing habitat for nesting, brood rearing, and winter survival ofpheasants,quail, and many songbirds. Besides producing food for insects, which, in turn, become food for birds and other animals, the grasses produce seeds, another source of high-energy food. Rabbits, deer, and wild turkeys eat the green browse. Planted in the right location around your property, these habitats also provide an attractive landscape. Cool season grasses grow most rapidly during spring and early summer when cool nights follow warm days. They include native Canada wild-rye, redtop, June grass, and introduced species such as timothy, orchard grass, and brome grass. Cool season plants also include legumes such as birdsfoot trefoil, alfalfa, and several kinds of clover. Many landowners mix legumes with cool season grasses because the legumes contribute to soil fertility and create food and cover for wildlife. Warm season grasses grow most rapidly during summer when warm nights follow hot days. They include the native or prairie species such as big blue-stem, little bluestem, Indiangrass, and switchgrass. Some landowners mix a half-pound of perennial native wildflower seeds (forbs) per acre to warm season grass plantings to create even more food and cover diversity and to add beauty. Many wildlife managers in Michigan prefer warm season grasses because they stand up better in snow than do cool season types, last longer, and are native to the state. Plantings of warm and cool season grasses next to each other will provide excellent variety and are the most valuable to wildlife. Site conditions to consider before planting include potential weed problems, drainage, erosion potential, and soil type, depth, texture, and fertility. Some grasses and legumes do better on dry sites, and others grow well on wet areas. Certain grass species have very narrow preferences, and others seem to do fine on most sites. Timothy grass, for example, grows well on sandy-loam soils that are fairly well drained. Switchgrass, on the other hand, performs on a variety of soil types. Certain clovers do better in wet areas whereas alfalfa responds best in well-drained soils of sandy loam. The panel below lists preferred soil type, moisture content, and tolerance for sun or shade for many types of grasses and legumes. Your Natural Resource Conservation Service office will have a county soil survey map, which should include your property. The map may help you decide what type of grass to plant and where. Also, refer to the chapters on Warm and Cool season Grasses and Prairie Restoration in this section. < p> Proper soil pH and fertility are necessary for the intended crop. A soil test will determine needs and recommend rates of nutrient application. Your county Extension office has soil test kits available for a small fee and can analyze samples for you. Before planting cool season grasses and legumes, the soil pH should be between 5.5 and 7.0. If lime is needed to raise the pH level, apply it at least three to six months before planting or the fall before your planting season. The level of pH for warm season grasses is not that critical; lime is not required, for example, on sites with a pH above 5.5. Follow the soil-test recommendations for adding nitrogen, phosphorus, and potash. The recommendations will vary, depending on what you intend to plant. For example, for cool season grass mixes containing legumes, 200 to 300 lbs. per acre of a starter fertilizer (such as 6-24-24 or 8-32-16) low in nitrogen and high in phosphorus is often recommended. Once the stand is established, the legumes will provide the necessary nitrogen. There are two ways to plant grasses. 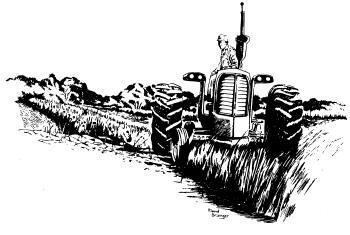 Conventional tillage uses plowing and disking (and sometimes herbicides) to prepare the seed bed to ensure proper seed to soil contact and depth. The key is to get a firm surface before planting, and the way to do that is to follow the plow and disk with a cultipacker or roller. A site has been properly prepared when a footprint barely shows. No-till planting uses special equipment called a no-till drill that cuts a narrow trench through the sod and soil, drops seed into the trench at the correct depth and distance apart, and presses the soil back in place. No-till planting reduces the amount of work to prepare the site and also reduces the potential for erosion. The method relies on herbicides to control weed competition. If planting into an area with tall grasses or sod, success demands that you kill unwanted vegetation the fall before. If no-till is your chosen planting method, then mow the area before the first frost or in mid-September. Two weeks later, spray a relatively safe, broad-spectrum herbicide such as Roundup, which will kill all emergent vegetation. Be sure to read and follow label directions. You can plant grass and grass mixtures with a no-till planter early in the spring before greenup occurs. If you are late with planting, you may have to kill weeds and other regrowth with another application of herbicide. If you choose to use conventional tillage, you must eliminate all unwanted vegetation by plowing and disking, which you should do in the fall. The following spring, plow and disk once more if regrowth has occurred (or spray with herbicide). For smaller sites, a roto-tiller may do the job of cultivation. A key reason that no-till is growing in popularity is that it does not disturb the soil, which may allow dormant weed seeds to germinate. No-till also reduces compaction because fewer trips across the field are needed. In addition, fuel and time are saved, and erosion potential minimized. Warm season and cool season grasses, as well as legumes, need only be planted 1/4 inch to 1/2 inch below the surface and require only 1/8 to 1/4 inch of soil as a cover. It is not uncommon to see seed sitting on top of the surface after planting. Cool season grasses are usually planted as mixes of several plant types at a rate of 8 to 12 lbs. per acre. Legumes used in mixes should constitute 50 to 60 percent of the mix. Warm season grasses can also be mixed and are usually planted at rates of 4 to 6 lbs. per acre of Pure Live Seed. If using switchgrass in the mix, however, add only 0.5 lbs. to 1 lb. because switchgrass is aggressive and may take over the stand. Warm season grass seeds tend to be fluffy and bulky. Pure Live Seed (PLS) takes into consideration that a pound of warm season grass includes seed hulls, inert materials, and seeds that will not germinate. To determine PLS producers multiply the percent of Pure Seed times the percent of Total Germination and list this information on a tag that comes with each bag of seed. Most warm season grasses will range from 50 to 95 percent PLS per bulk pound, and there will likely be a difference between each bag of seed or each grass type. Grass and grass mixtures can be planted with a no-till drill, one of several mechanical spreaders, or broadcast by hand. Warm season grasses are more difficult to plant because of the fluffy nature of the seed. When run through typical broadcasters and no-till planters, the seed tends to bridge over the top of the mixing unit and will not flow properly. When broadcast planting, planting rates should be increased 25 percent above normal rates. Special no-till planters are now available that overcome this problem. Another option is to buy debearded seed, which has the fluff removed, although it will cost more and may be hard to find. Switchgrass seed is the only warm season grass type that is smooth and therefore will run through conventional planting equipment. Plant during the period April 15 to June 15. If soil moisture and temperatures allow it, early seeding is preferred. You can also plant cool season grasses during August; however, spring plantings are more successful. In areas with little fall vegetation, such as a recently harvested bean field, frost seeding in late winter/early spring is an alternative. Broadcast seed over the site and the alternating thawing and freezing action will work the seed into the ground where it will germinate. Frost seeding is an especially good method to use on wet sites that equipment cannot reach during peak planting time. Be sure to inoculate all legume seed before planting. The inoculant is a graphite-like bacteria that, when mixed with water and then applied to the seed, allows the plant to use nitrogen from the air. If frost seeding, double the rate of inoculant. The above panel lists a variety of mixes that can be planted to benefit wildlife. Cool season grasses and legumes are usually evident in the first month after planting, and attractive, solid stands are often the norm by the end of the following spring. Because warm season grasses grow more slowly and in clumps, they require three to five years to establish themselves. After the first growing season, it is not uncommon to have only one plant per square yard. The grass may only be six to eight inches tall and difficult to recognize until it grows a seed head in late summer of its second year. After the second growing season, each plant may be one to two feet tall and occupy a square foot or so. By the end of the third growing season, you should have an established stand of native grass three feet tall or taller, depending on the species planted. Patience is the key to growing warm season grasses. Give them a full three years before deciding if your planting is a success. To ensure success of any grass planting, you must control unwanted vegetation. If using a herbicide, choose a selective type like 2-4-D, which will kill broadleaf plants (including clover, other legumes, and forbs), and be sure to read and follow all label directions. Your county Michigan State University Extension office can also help identify the problem and will suggest an appropriate herbicide. Mowing before annual broadleaf weeds go to seed may be a better option. After planting warm season grasses in the spring, mow for the first time between July 15 and August 31. If weeds continue to be a problem the next year, mow again before April 1 . The best time to mow cool season grasses is July 15 to August 31. This avoids the nesting season of most birds. Always mow warm season grasses at a height of eight inches or more to avoid injuring plants. Cool season grasses and legumes should be mowed at four to six inches to stimulate late-season growth. You can allow livestock to graze warm season grasses in late July and August. If you do not require winter cover for wildlife but want spring nesting cover, you can allow livestock to graze cool season grasses until October. Do not allow livestock to graze any type of grass below eight inches. Grasses and legumes that are hayed or grazed (including heavy browsing by deer) should be “top dressed” with fertilizer or manure after each seasons' hay harvest or on a three-year rotation. Top dress with 100 to 200 lbs. of 6-24-24 fertilizer in a mixed grass legume stand or 19-19-19 fertilizer in pure grass or grass dominated stands. Proper mowing or grazing and top dressing will help keep the stand in vigorous, high-quality grasses and legumes for many years. Disking is another method to stimulate regrowth and reduce competition from dogwood, sumac, aspen, and other invasive woody plants. If you plan a annual treatment, consider mowing or lightly disking about one-third of the grassland each year. Try to mow strips from 30 to 60 feet wide and leave undisturbed areas of 60 to 100 feet wide between them. Burning is also a key management tool every three years or so for warm season grasses and wildflowers. If possible, burn one-third of the grassland each year. Carry it out in early spring when vegetation is dry and do it on a day with light wind. Discuss your plans with local authorities, obtain the necessary burning permit, and observe all restrictions and safety procedures. For more information see the Prescribed Burning page. In summary, depending on your goals and current field conditions, there are a variety of grasses or combinations of grasses you can plant to meet your needs. There are, as well, several planting methods available to get a successful grass stand established.